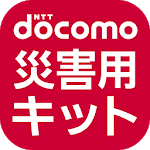 “Disaster Kit” is an app for docomo smartphones which enables you to use Disaster Voice Messaging Service, Disaster Message Board Service,and Early Warning “Area Mail”　provided by NTT DOCOMO. 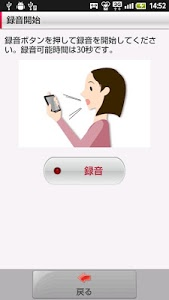 ※Disaster Voice Messaging and Disaster Message Board services are activated when a big disaster occurs, such as a level 6 earthquake (Shindo according to Japanese measurement). The services are only available during disasters but with this trial, you have the opportunity to see how the app works in case of a disaster. 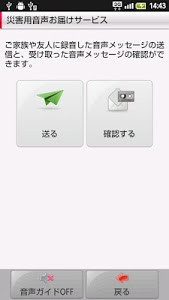 ※For some devices, Early Warning "Area Mail" isn't available, while　others are available by updating software. 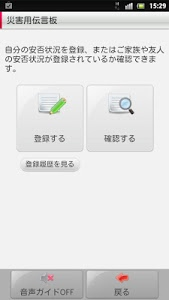 Please check the compatible devices on a web site of NTT DOCOMO. It’s a voice messaging service that can be utilized during a disaster. In case of a disaster and when calls cannot be made due to network congestion, you can send/receive recorded voice messages for safety confirmation using your docomo phone or smartphone via packet service which is transmitted more easily even during a disaster. Recording can only be made in Japan, however you can play the recorded messages on docomo phone when roaming overseas networks*. 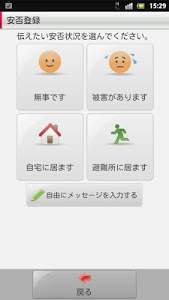 On the Disaster Message Board, you can register your safety status via your docomo phone or smartphone in the areas where the disaster occurred. 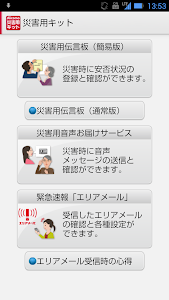 The Disaster Message Board can be accessed on phones and the internet from anywhere in Japan for safety confirmation. The Disaster Message Board can also be accessed by docomo phone when roaming overseas networks*. Early Warning "Area Mail" is a service that enables you to receive earthquake early warnings and tsunami warnings issued by the Japan Meteorological Agency. In addition, this service enables you to receive disaster and evacuation information issued by national and regional public institutions. Subscribers instantly receive information that is distributed simultaneously to the applicable areas. When the information is received, you are notified by a popup display and special emergency ring tone.